What can you as the teacher do to make the best use of an iPad in the classroom? 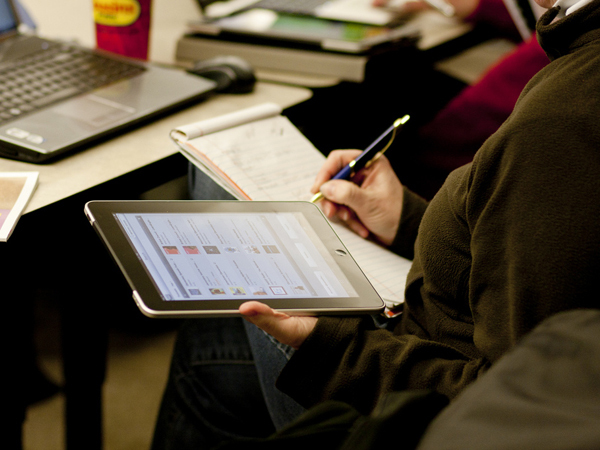 Start using your iPad in class by making small changes in your teaching methods. As you become more competent you can replace more traditional teaching methods with the iPad. Share your content with the class. Connect your iPad to your digital projector and show learners content on your whiteboard or wall. Use apps containing photographs, sketches or diagrams and invite learners to point out certain elements. Encourage learners to create their own content. This can be a fun group activity where learners work together on the content and load it onto the iPad to present to the class. Learners can do their own research. When you’ve presented a lesson, encourage the learners to find more information on the subject on the internet. Good planning remains important. Don’t be misled by the fact the iPad will initially enchant the learners. It’s still extremely important to be well prepared. When you use an app for the first time in class, make sure beforehand the links work. Integrate iPad in everyday lessons. Don’t set aside special “iPad classes” to use the iPad. Integrate your iPad with the existing curriculum. If you’re doing a lesson on creative writing or the atom, for example, find video recordings or apps that will supplement your lesson. Change your content. The great thing about an iPad is that you can change the content of your lessons if you find it’s not working. There are many apps that can help you regularly create fresh content. You don’t have to do the same thing year after year. Which apps can you use? Apps are developed specifically for iPad or Android, so make sure the app you want to use will work on your tablet. The best place to search for apps is in the iTunes shop. More than 100 000 apps developed specifically for education are available there. Although many apps are available only in English, there are already a few available in Afrikaans. Some can be downloaded free (have a look at the apps recommended for the learners). If your learners are working with iPads make sure they look after them properly. By applying the following rules you can ensure the iPad doesn’t become just another distraction from the lesson. The iPad screen must be shut while the teacher is talking. The iPad must be the only thing on the desk when it’s being used. Use the parental control on the iPad to limit certain content and/or apps on the learners’ iPads. Don’t allow any food or drink near the iPad. The iPad must be set to “silent” at all times. Lock up the iPads in a safe place when they’re not in use. The iPad is an aid that’s supposed to supplement education, not replace good teaching. Use it to support you in the teaching process by, for example, preparing additional exercises on it. There’s no right or wrong way of using your iPad in class. Do research, experiment and test apps so you can prepare outstanding lessons for your learners. And be prepared to laugh with the learners if an error slips in. Boerseun wil vir jou op sy hande dra. I'm a 47 year old man looking to meet women between the ages of 28 and 50.